One of the multitude of ICT companies in Germany operating in the field of software innovation and embodying many of the aspects referred to by Dr Herbert Zeisel, EKS InTec GmbH, is based in Weingarten. It is a partner for the development, design and software as well as virtual commissioning of simple to complex production plants and special machines for the mobility industry and its system partners. Its range of services cover the whole spectrum from process planning, through the design of stations and complete production systems for body manufacturing to the simulation and optimisation of production processes. Dr Anton Strahilov is Head of Research and responsible for the R&D effort and the coordination of projects. "2014 was an important year for our company. Until then, we had gone by the name Rücker EKS GmbH," Anton explains, "but then FFT Produktionssysteme GmbH bought a 100% shareholding in the company and for the past three years we have been known by our present name EKS InTec. But our foundation goes back to 1994 when the company began with a focus on the engineering of production equipment and systems." Later a separate division was started to create a software application suite to simulate production systems, specifically with the goal of realising the virtual commissioning of entire production plants. 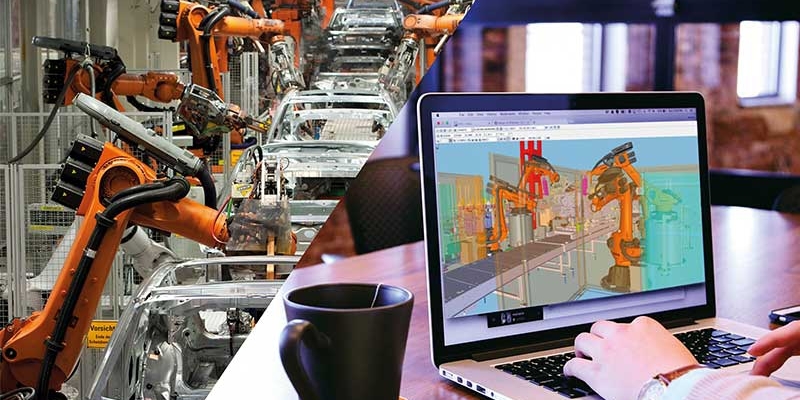 "This new division was responsible for creating an innovative simulation system, INVISION, that allows the planning and visualisation of production operations in real-time simulation. As a sequel to this simulation software package, we developed our RF::Suite," Anton continues, "which is a software family that contains a number of different tools that take a step further the specific functions developed in the INVISION tool, like translating the specific manufacturer’s robot programs into a unified language and enabling the simultaneous processing of the kinematics and the I/O signal processing. RF::Suite allows innovative planning, analysis and predictive maintenance of real plants, acting as a digital shadow. You can see it, therefore, as both an extension of the earlier tool and extendible, too. We are now able to represent the complete digital development process. And this has proved very successful to date. These two tools played a role in the success of the ITEA AVANTI project." EKS InTec is one of the very few suppliers of such kinds of virtual commissioning tools, and certainly the leading organisation in Germany in this respect. "What makes us unique," Anton says, "is our tool family, which is made up of several separate tools that you can use standalone or extend, depending on the requirements of the system. And the other unique aspects is our speed of response to customer needs. We operate with very rapid turnaround times. We can create a function for and with our customers that they can then use in their version within just a month. We are strongly geared to the automotive sector. In fact, we work exclusively in this area where our customers have a real need to optimise their production. So they need a digital twin of their actual production system. That is, running in parallel. Our software, therefore has to be able to ensure that they can do this. Therefore, innovating the software is a key feature of our work. We constantly have to improve our software, extend it, to change functionalities so that we keep pace with changing customer needs." Cooperation with suppliers is equally as important as cooperation with customers for EKS InTec’s tool development process. And as Anton explains, it is also one of the reasons why the company is involved in the kinds of publicly funded projects that Anton coordinates in his role as head of research. "We needed to get together with our component supplier, Schneider Electric, and the ITEA ENTOC project gave us that opportunity. Briefly, this project aims at developing standardised modelling strategies and optimising the engineering tool chains used for complex production plants. By collaborating with our component partners, we get to improve our simulations and we can use the knowledge we gain to make improvements and innovation. Currently we have five innovation projects either running or expected to start, four of which are ITEA projects. In one of these projects, SPEAR, which began in 2017 and runs until 2020, we actually take the lead." SPEAR is focused on the development of a flexible optimisation platform to help improve a broad spectrum of industrial production processes in terms of energy-related aspects. "In this project," Anton explains, "we want to optimise the energy consumption of plants’ production processes, production lines and (industrial) buildings, both new and existing ones. The method we develop will be applicable to both virtual commissioning as well as actual operating production systems. This project signifies a really important step for us in a new industrial area." "But if we look at the current European funding mechanism, in terms of the definitions of the EU, we are, with just over 100 employees, too large to be regarded as an SME because we are a daughter company of FFT Productions system. This means that we don’t get the national funding we would otherwise receive as an SME. Nevertheless, in order to develop our functionalities, extend our workflow and develop our networking, we need to work with other countries and with other partners. So while the funding situation can be improved," Anton concludes, "the value of working in international projects is too good not to be involved. It is through them that we can gain the knowledge and experience we lack. Like ITEA, which gives us the possibility to do research and create innovation in our area. We have benefited greatly from the projects in which we have been involved. By participating we also gain insight into the market impact we can have, not just in Germany but beyond, in Europe and even worldwide. This is all contained within the ecosystem of the ITEA Community and is a very important rationale for our participation in it."